We Have A New Front Sidewalk! As of this morning, the new sidewalk from the street to the front porch is finished! 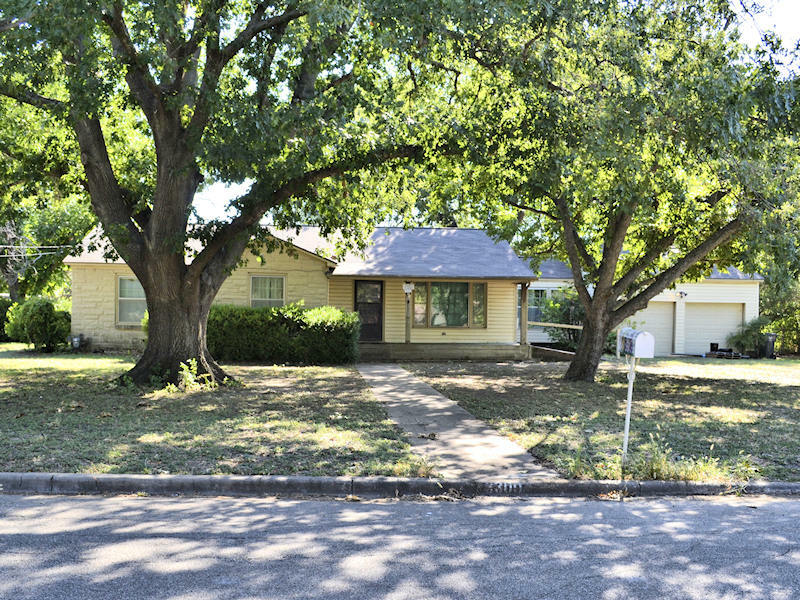 And I can’t believe how much a simple sidewalk can transform the front of a house. Remember what it looked like before? It was narrow, old, cracked, and had low spots where it flooded every time we got a hard rain. And now, it looks like this! I took that picture right after they removed the forms early this morning and then wet the concrete down. I wasn’t quick enough to get the pictures before he grabbed the hose and started spraying it with water, so I’ll get better pictures later. In the end, I decided to go with just plain concrete with a broom finish. 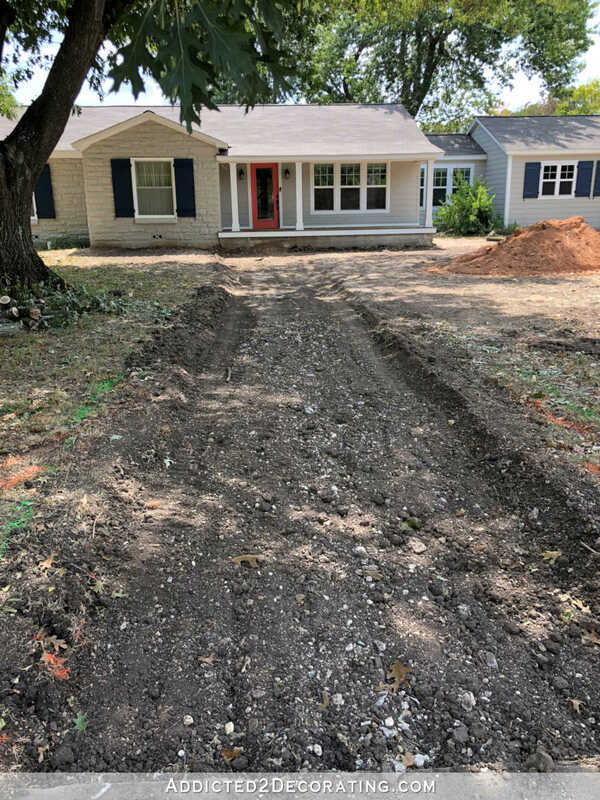 I had hoped to have exposed aggregate, but the city requires that the first seven feet from the curb be plain concrete, and I just couldn’t imagine having seven feet of plain concrete and then the rest exposed aggregate. So plain concrete it is, and to be honest, I’m perfectly fine with that. It’s the easiest to maintain and keep clean with a pressure washer, and I’m incredibly happy with how it turned out. The most surprising part of that process was watching the flower garden border being removed. I couldn’t believe how thick and deep this thing was! It was almost as if it was originally intended to be a foundation perimeter and not just a flower garden border. It was so heavy and thick that he had a hard time breaking it apart. But finally, it was all gone. 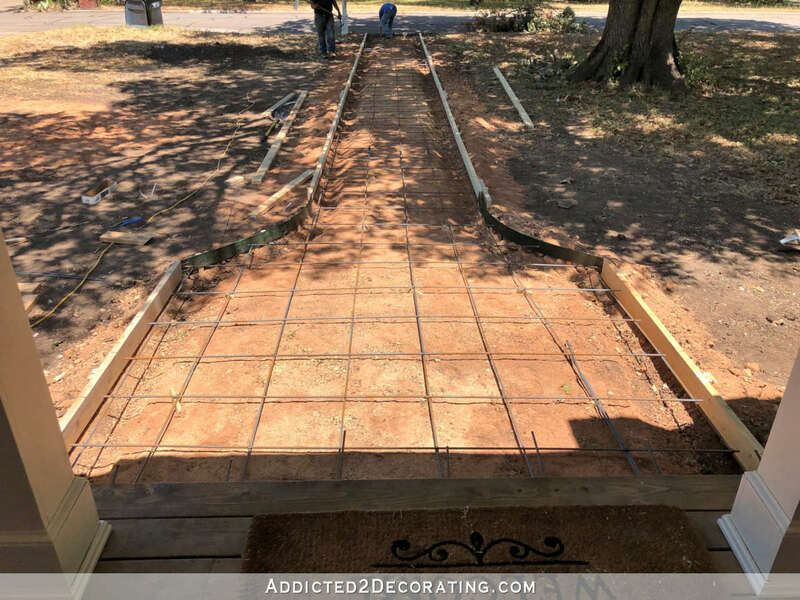 Then on Tuesday, they started setting the forms for the new sidewalk, and on Wednesday they added all of the rebar. Interestingly, the original sidewalk that was removed didn’t have a single piece of rebar or reinforcement of any kind. This one, on the other hand, is thoroughly reinforced and tied into the porch foundation and the curb with rebar. I don’t know why, but I just love watching concrete being poured. But it all worked out perfectly, and I just love this new sidewalk. 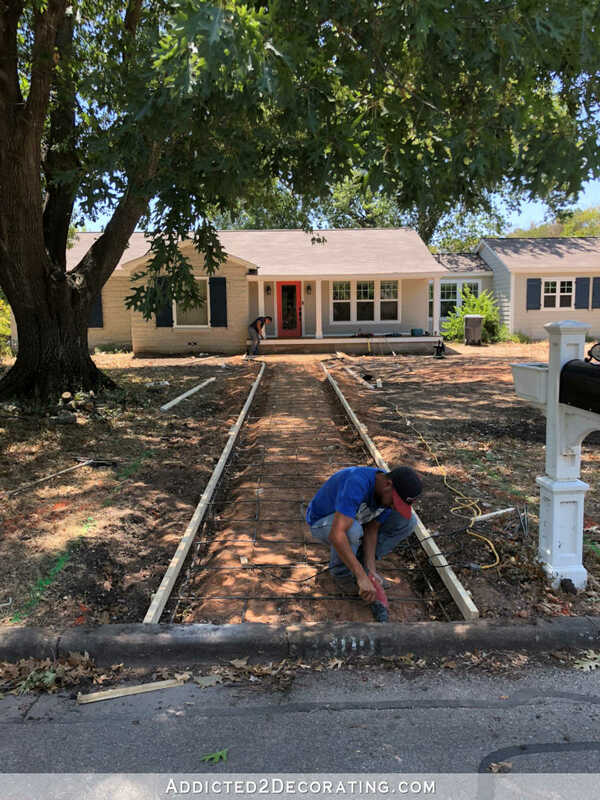 The two curves on each side will eventually veer off into additional sidewalks — one that will meet the driveway close to the studio portico door, and another that will go the other direction, around the side of the house, and to the back yard. My goal is to have sidewalks all the way around so that Matt can get all the way around the house easily. But those will have to wait. 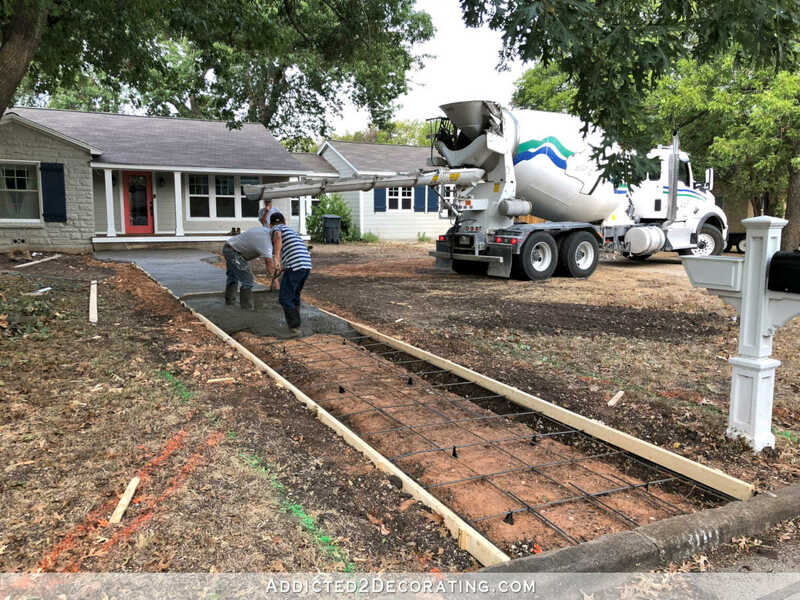 As far as concrete goes, the driveway is our top priority now, and that will cost a small fortune. So for now, I’ll just enjoy my shiny new front sidewalk and plan my new, wide front steps. Next Post DIY Six-Drawer Console Table With Lower Shelf - Finished! I look forward every day to seeing your progress! Oh yes, I can just see it with plants running down the sides. Lovely! Looks great! It’s always amazing to me how something rather basic can make such a big difference. I’m like you, I love to watch demolition too! The sidewalk looks great. And that was genius to think of using the concrete out of the truck to cover and match with what was already poured. I wouldn’t have thought of it. I’m so happy you’ve been able to get some exterior projects done. It helps balance your brain in knowing that, yes, it’s all getting done, inside and out. It also gives variety to plan and work on. You are making such a fantastic place from your “diamond in the rough”. Love seeing all your progress. Looks like they did a great job and it sure looks good. 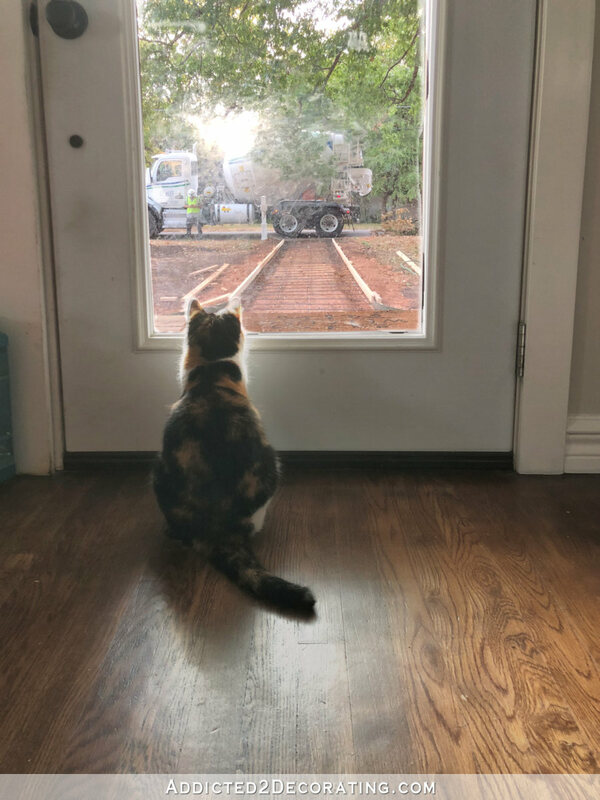 Nice to see there is someone in this world that gets excited about watching concrete being poured and be amazed at Crispin solving a problem so easy. Believe he has been doing this for a while. Makes you feel like you definitely hired the right man for the job! 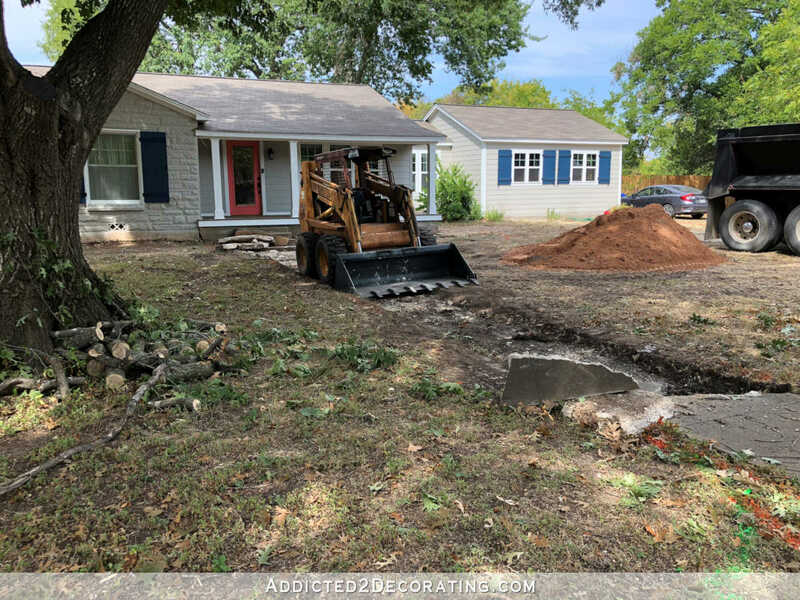 I watched and photographed my driveway being redone. It was fascinating; I couldn’t figure out what the propane tank was for till they began to roll it out. Of course the huge machine can’t get real close to the house so they use a torch to heat the material along side the house then hand tamp it. Looks great! 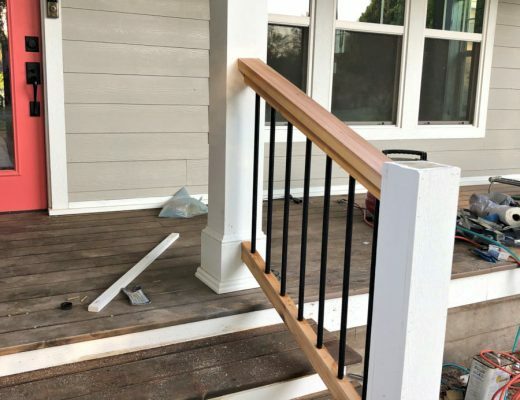 how will Matthew be able to get down the steps to access the sidewalks around the house? What kind of plantings will you be putting along the sidewalk? He will exit at the back by the carport where there is a ramp. From there he will be able to access the sidewalks that will go around the house. It is so exciting getting something new and improved. 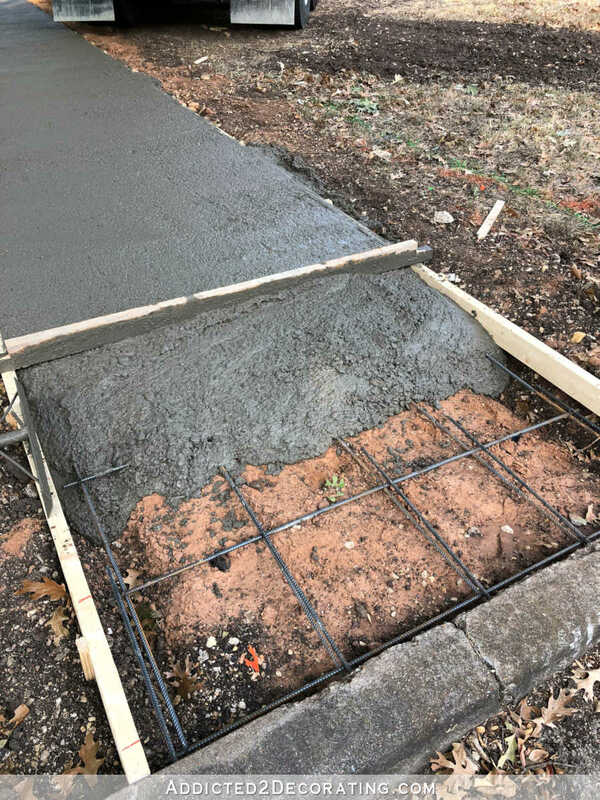 We had awful sidewalks for years and I was ecstatic when we were able to get new! Looking great Kristi! It looks fabulous!!! Classic broom swept for the win! Sometimes it’s kinda nice to have the choices narrowed down. I can’t remember- which cat took a walk on the wet countertops? 😀 While I’m sure it wasn’t funny at the time… that’s such a cat thing. lol Was it Peeve? Or the one that has passed? She lost their dog Boo. Don’t believe she lost a 🐈. That was Powder, our little flame point Siamese who died in 2014. And you’re right, it certainly wasn’t funny at the moment. I freaked out when it happened! 😀 But we’ve had quite a few laughs about it since then. It looks great! So happy that you have this off your list. Keep up the progress. I was mesmerized by the concrete pour at my house as well:) A lot gets done in a short amount of time! 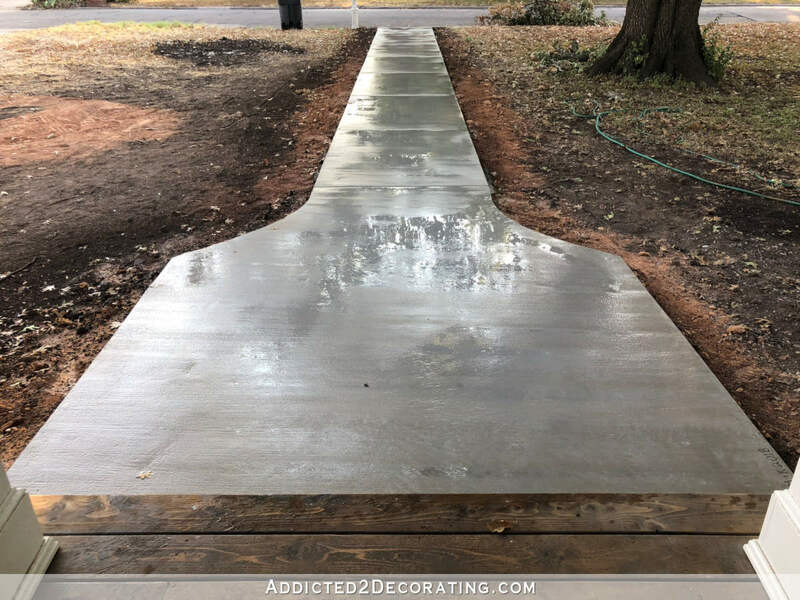 My concrete guy told me to NEVER pressure wash my patio, sidewalk or driveway…. Yes i have been told that, too. How does one clean it then? I wasn’t told that. Ours need cleaning badly. Our concrete guy said to hose it down, squirt dawn dish soap on it, then scrub with a stiff bristle brush. Once that’s done, I seal it (each year) with sealant applied with a roller with a fairly flat nap. And as he says “don’t paint yourself into a corner!” After 24 hours it’s good to go! Should have said “and”- LOL- typing too fast! I have exposed aggregate that runs along the street in front of my house and that stuff is SLICK when it’s wet. It may have to do the age because it’s really old. Either way, even though it was put in by the town, I’m the one responsible for maintaining it and also the one responsible if anyone falls and gets hurt. I live in fear that someone will slip on it when it’s wet. I live in a really small town, with very little traffic on the side streets, and most everyone walks in the street instead of using the sidewalks, so fingers crossed. And your new sidewalk looks fantastic!! I hope you sneak a hand print or at least a date on it before it dries…maybe under where the new steps will be built? I hadn’t thought about the cities’ easement and your walkway. I wouldn’t want two different looks either. Let’s hope they won’t need to mess with your walk ever, because I’m sure then your color will be off as well. I too love watching this sort of thing! We were at our house build almost every day (told our builder to expect that from us when we hired him! LOL!) 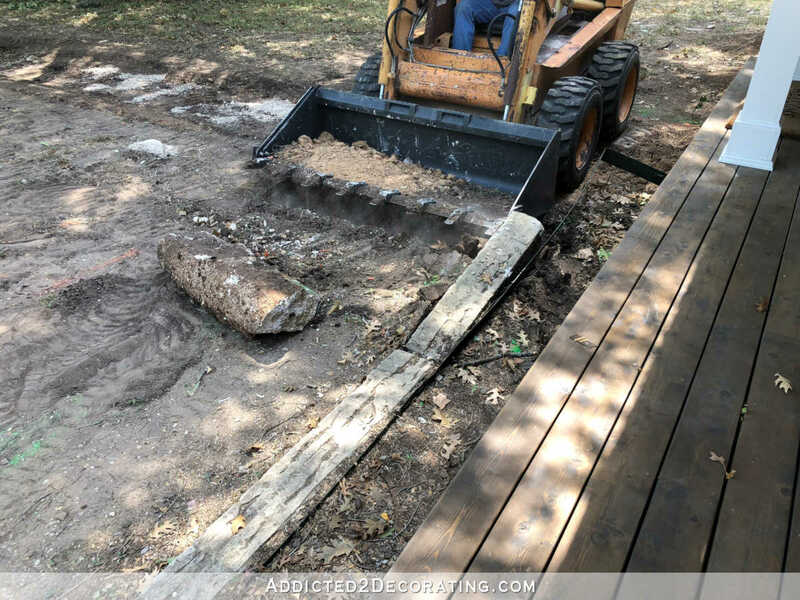 and got to learn a bunch of things – more of the “whys” in regard to the processes and it gave us a calm mind knowing that “this is done before that, so this can be done easier.” We were late arriving for our driveway and walk pour, and as a result, the walkway wasn’t done the way I wanted. But I found out it was because it would have required more concrete, and the budget was already overrun, so it was reduced to standard width and length. I wanted it further away from the house for bigger planting beds, and a more serpentine shape. Not a big deal, but it was at the time! I’m over it now. Looks so long and great. Precious kitty was making sure they did it correctly, too cute. Our furbies are so nosy when something is going on at our home – just keeping the peace. Looking good! I have a question though. Will there be a second accessible exit for Matt? 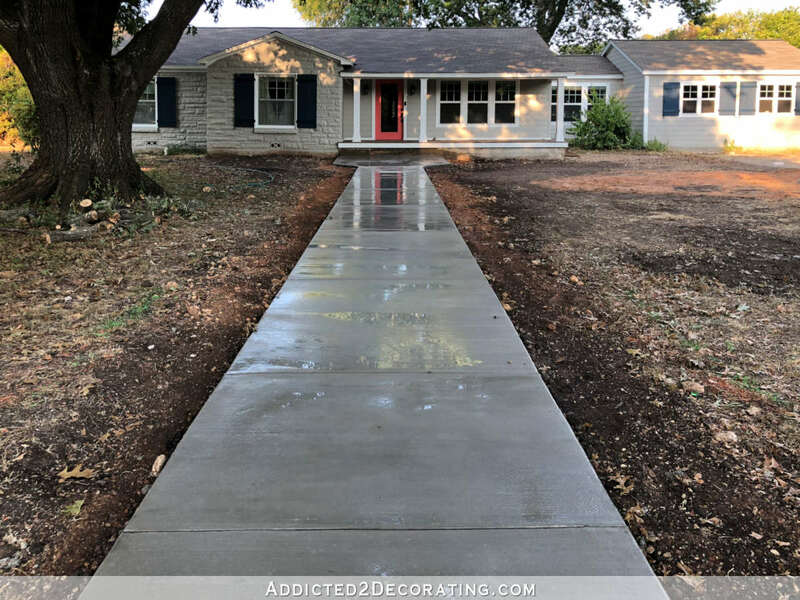 What a difference your new sidewalk makes to the front of your home. It’s night and day difference!!!! 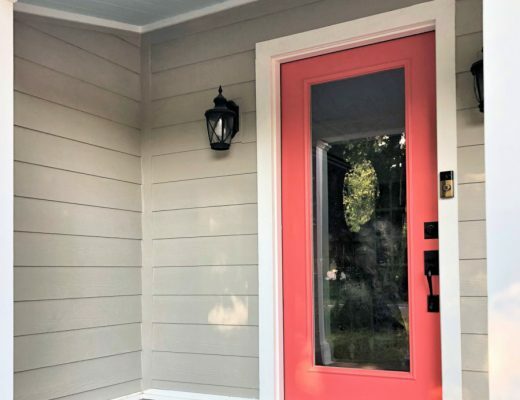 Your curb appeal is really ramping up! Great job. 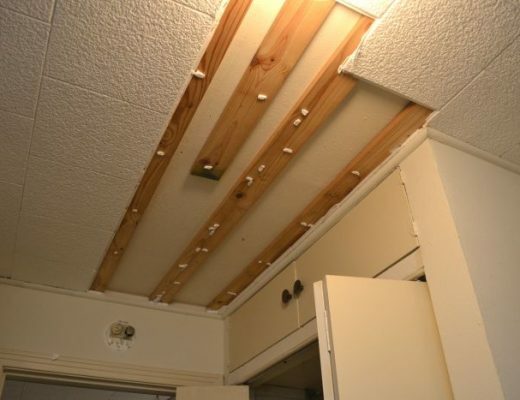 Kristi, I have been fascinated by all your renovations and projects. Your sidewalk turned out perfectly. I am living in a 1950 ranch very similar to yours. We’ve done all new windows, siding and interior floors. Now we are getting estimates for a new concrete drive, raised covered walkway/porch and large back patio. It is expensive but will be so worth the additional value. Unfortunately, our small town requires the end of hardscaped driveways to be asphalt. I can’t imagine how this will look at the end of concrete. Ugh. Estimates for concrete drive is $2300. So far we’re looking at $4300 for all three projects. I am basing my covered walkway/porch on the picture of your new raised porch. You are an inspiration.